Casa Big Sur is a one-of-a-kind custom modern tropical masterpiece. Nested perfectly in the hills of the Escaleras community, Casa Big Sur offers some of the best views available of Costa Rica’s dramatic Pacific Coastline which is dotted with islands and headlands as far as the eye can see. The southern zone is famed for its panoramic ocean views, dazzling sunsets, all with a backdrop of pristine primary rainforest filled with a diverse range of flora and fauna. The owners will enjoy the full use of Casa Big Sur’s amenities six weeks per year at a fraction of the cost of traditional second home ownership. What is “Casa Big Sur”? The essence of Casa Big Sur is that it is a unique setting on the Pacific Ocean in Costa Rica in a beautiful home designed primarily for families. 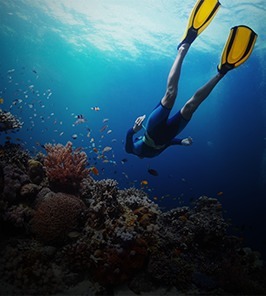 It is priced to attract working class families interested in vacation ownership through our innovative fractional ownership plan. Membership includes a 1/8th ownership which is evidenced by a real estate title, recorded in county records and insured by a title insurance company. Your deeded undivided interest can be mortgaged, willed, sold, placed in a trust or owned by an LLC. How much time do I get to use Casa Big Sur? Casa Big Sur has its own software created by Luxury Fractional Guide. With a priority rotating system, on November 15 of the calendar year each of the 8 fractional owners will be notified via email that the selection process is to take place. The first owner in the rotation shall choose any two weeks of the following year. Then, the second in priority owner picks two weeks, with the rotation taking place through the 8 owners until the rotation has been complete. There will be a total of 4 rounds of selections; two rounds of two week selections, and then two rounds for one week selections. This will give the fractional owner the flexibility to choose the time that works best for the owner and his family every year. Also, the software has an Owner Exchange and Rental Component which allows the owners to exchange or also rent their weeks with other owners, thus providing even more flexibility. Please request to see the chart for the next ten years. How are we different than a regular timeshare? 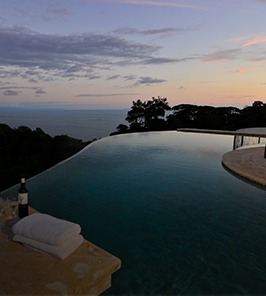 Casa Big Sur was built for the enjoyment of member’s families; it is built to a much higher standard than timeshares. We are a deeded property and offer the prospect of appreciation in value. Member’s actually own their residence here at Casa Big Sur and have much more ability to spend time at their vacation home. When will the Casa Big Sur be available? 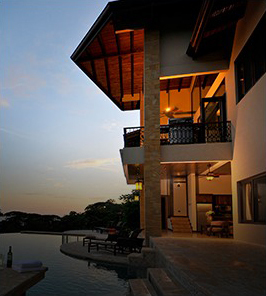 We are pleased to say that Casa Big Sur is completed and ready for your inspection now. What services are provided to Member/owners? Casa Big Sur has the luxury of actually having our developers also involved with the property management company. Our goal is to continually be in touch with our members, and providing services that one would expect in a five star hotel. Everything should be perfect upon our member’s arrival. What amenities are available to Owners at Casa Big Sur? Can my ownership be re-sold? Yes, most definitely, either through our marketing efforts or with local real estate agents, who are very familiar with our Casa Big Sur. Can I rent out my resident weeks to other parties? Yes, renting your property will be professionally handled by our management company and Elite Distinctions, who need to be alerted should you elect to rent. Are there homeowner association fees? Yes, Casa Big Sur does have the normal expenses associated with the everyday operation of the residences just as in any ownership. Are there any other developments in the surrounding Dominical and Uvita area? Yes, there are other developments, however, only a few are true community designed and implemented. Most developers subdivide the property and make as many lots as possible without providing power and water, basically selling land without any infrastructure, guidelines (CCR’s) or design details to make a community. Because of the dramatic geography of the land, existing developments are tucked into the mountains and can be hard to spot. Casa Big Sur is located in the Southwest Pacific region of Costa Rica and can best be described as a place “where the Mountains and the Rainforest meet the ocean.” All the beaches are still extremely uncrowded, breathtaking and a place where nature abounds at every corner. Casa Big Sur has a 24 hour, gated guardhouse at the front entrance. 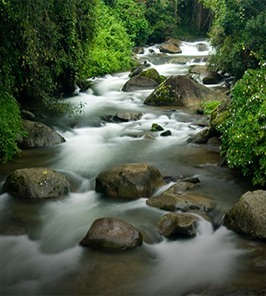 Natural borders such as rivers and a nature reserve or mountains enclose the rest of the property. As for “developments”, purchasers have been very active in the Uvita/Dominical region due to all the infrastructure that is in place, extension of national highway, new hospital built, banks, grocery stores, gas and service stations. Escaleras, where our properties are located, is a 10 minute drive south from Dominical. Dominical is a quaint fishing and surfing town located on a Palm Tree lined beach which has plenty of shops, restaurants, and a nightlife. Also, Dominical is an extremely good beach break for surfing. The entire Southern Zone of Costa Rica boasts world-class fishing. Sport fisherman come from all over the world to try their hand at catching the elusive Marlin, Sailfish, Rooster fish, Mahi Mahi and many other game fish popular and plentiful in these waters. In Uvita a new town center was recently completed which includes all the amenities and necessities you will need to live comfortably. Just 5 minutes from Casa Big Sur you will find a doctor’s office, four new supermarkets, three national banks, a furniture store, hair salon, dentist, service station, service center, restaurants and a veterinarian among many other things. All these make Uvita one of the best beach towns in Costa Rica. In this area the coastal highway hugs the ocean and is in excellent condition, providing a comfortable ride and amazing ocean views. Dotted all along the highway are small “sodas” or family owned restaurants where you can get fruit juices, fresh coffee and home made pastries. Just 30 minutes from Casa Big Sur is the area’s newest hospital in Cortez, opened in April 2008. Do big storms hit the area? The short answer is no. Hurricanes that form typically take a northern track, normally leaving Costa Rica unscathed. There have been fluke hurricanes in the past which have brushed the coast, but it’s a rare occurrence. There is a rainy and dry season. The rainy season lasts from late June to December. Does that mean it rains everyday during those months? No. You might get rain every night or a cool rain in the afternoon or no rain for an entire week. The ‘dry’ season in the Southern Zone (Uvita) is far from totally dry. Being that Uvita is predominately rainforest, it remains plush and green all year long. On the otherhand, the Northern Zone (Guanacaste) experiences no rain for months on end and gets desert dry during their dry season. The Costa Rica government is democratic and the most stable in Central America. Many Costa Rica government policies are considered to be shining examples for other Latin American countries including their national parks, healthcare system and educational system. ‘Ticos’, as Costa Ricans call themselves, are generally friendly and gracious, helpful and hospitable people with an uncanny ability to understand even the most fractured Spanish, the official language of the country. Many Costa Ricans, especially those working in tourist and service related fields, are bilingual. The towns of Dominical and Uvita are filled with nothing but gracious smiling people that love their country. Definitely an island vibe going on down there. Óscar Rafael de Jesús Arias Sánchez was the previous President of the Costa Rica government, and won the Nobel Peace Prize in 1987 for helping to peacefully disband civil conflicts between many Central American countries. The new President is Laura Chinchilla, who is continuing and improving upon many of the previous administration’s top priorities. Among Latin American countries, Costa Rica ranks 4th in terms of the 2007 Human Development Index, and 48th worldwide (out of 195). Costa Rica is ranked 5th (out of 195) in the world in terms of the 2008 Environmental Performance Index, up from the 15th place in 2006. In 2007 the Costa Rica government stated that they want Costa Rica to be the first country to become carbon neutral by 2021. Costa Rica has a higher literacy rate than the U.S. And the Costa Rica government has truly placed a high priority on education for their children and a low priority on military dominance having abolished the army in 1949. Costa Rica’s poverty rate fell almost 4% to 16.7% in just one year, according to the Home Poll 2007 realized by the National Institute of Censuses and Statistics (INEC). This was the biggest fall in 15 years. Overall, there was an increase of 19% in salaries throughout the nation, suggesting that the new jobs that are coming to the country are better paid. Many of these jobs were in the commercial, hotel, restaurant, construction, financial advising and real estate industries.